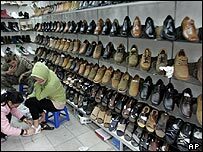 The European Union (EU) has finally adopted duties on shoe imports from China and Vietnam in a dispute over alleged dumping of cheap footwear. The announcement came after a vote by trade officials from the 25 EU nations earlier this month highlighted divisions over the planned tariffs. While Italy and Portugal wish to protect their own shoe firms, others like the cheaper Far Eastern imports. But the European Commission voted in favour of the measure on Thursday. In a statement, the EU's executive body said that it had "identified clear evidence of disguised subsidies and unfair state intervention to the leather footwear sector in China and Vietnam". Trade Commissioner Peter Mandelson has proposed duties of 16.8% against Vietnam and 19.4% on China to be phased in over five months, starting at 4% in April. Mr Mandelson said that tariffs were necessary to correct the damage that cut-price shoe imports were doing to EU firms. But he added: "It is important that we act against unfair trade while encouraging legitimate and competitive trade from emerging economies. "We do not target China and Vietnam's natural competitive advantages, only unfair distortions of trade." China has urged the EU to reconsider its action, saying the planned measures are unfair. Chinese officials say there is no evidence of dumping and question whether the duties conform with World Trade Organization rules. China exported 1.2bn pairs of shoes to Europe last year, while Vietnam exported 265m pairs. According to the Commission, the tariffs will add £1 to the average import price of the footwear of about £6.